To run application as different user from the current logged on user in Windows, the login credentials are read from an encrypted file. Run an application as administrator or any other account without installing the service of RunAsRob. Delegate particular administrative tasks to limited users, by send them an encrypted file, in which the program for this job is authorized. By this way, you can also distribute software by providing an encrypted file, in which the path to the setup.exe and credentials of an administrator account are stored, to start the installation as administrator. With run as different user of RunAsRob, you can substitute a colleague by running the according program with his login credentials from an encrypted file. If you must work under an administrator account, you can run specific software or an internet browser with limited rights, to minimize the security risk. As administrator you can easy test and verify software, if it is running with standard user privileges, without logout and login procedure. This field shows the path of the application in the encrypted file which can run over Runas Rob. Here you can change, select or enter the full path of your application. Credentials of the administrator who is written in the encrypted file to start the application over this authentication. With the crypt file buttons you can open, save or test an open encrypted file. You must save your changes over the >> save crypt file << button before you can test it. On this field you can input arguments or options your application require. Directory where your application should executed. 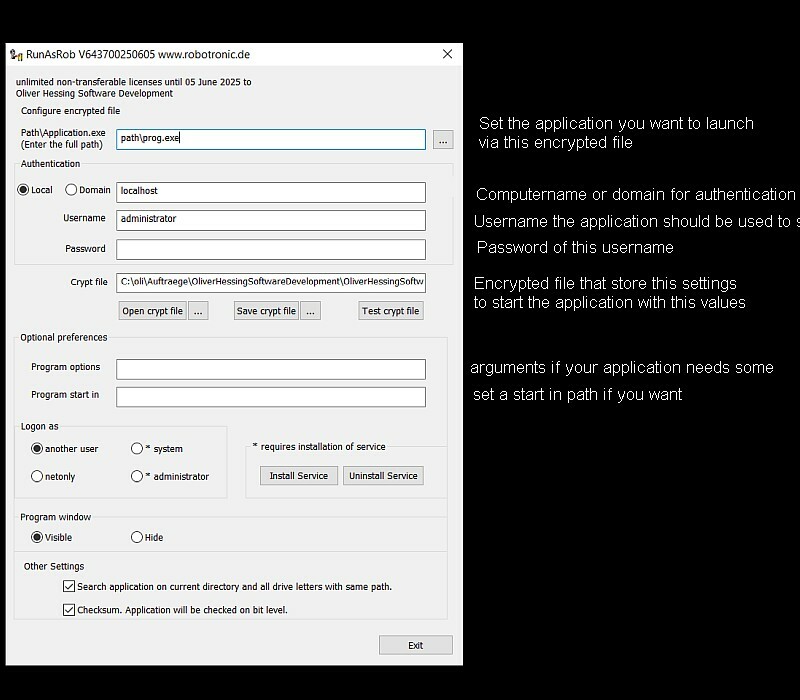 another user >> application run under the authentication in the encrypted file. netonly >> application use logon credentials only for remote connections. *service >> application start with system rights and elevated privilegs under the local system account and bypass the UAC Dialog. *administrator >> current logged on user will login as a member of the local group administrators for the autorized application. By this option the own profile and environment of the current user is used. Therefore the user have to input his own credentials to launch the allowed application as a member of the local administrator group. Set it visible to show the application for interacting with the user. Set the option Hide to launch the application in background. Run application under a limited user with credentials of an administrator account without installing RunAsRob service. Start RunasRob.exe and press enter to open the configuration window for encrypted files. Enter the administrator authentication you want to use for it by fill out the authentication fields. Check your generated crypt file over the button >>Test crypt file << and your application should be start under the settings you entered in the configuration program. You are finished. Close this configuration window. Run application as administrator under a limited user account with his own environment. Login as limited user to check the encrypted file. Now the user will be asked for his credentials to launch the applicaiton under his own account and profile as a member of the local administrator group. RunasRob is only free for private use. For companies and other organisations we deliver a licensed version, registered to the organisation name.